Place a plastic freezer bag with cotton swabs that have been dampened with water or dipped in eye cream in the refrigerator. If you wake up puffy, a gentle roll under the eye will instantly get rid of puffiness. 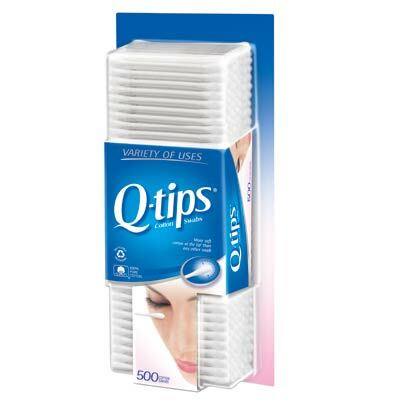 Keep lip color from bleeding by using Q-tips to apply loose translucent powder along the outer edge of the lips. It’s perfect for removing the gunk that builds in the inner corners of your eyes without ruining your makeup. I love to keep Q-tips soaked in makeup remover in a small Ziploc bag for touch ups throughout the day. To help thicken lashes and keep mascara lasting all night long, sandwich a dusting of powder between two coats of mascara. First apply one coat of mascara, then dip a cotton swab in translucent powder and sweep over lashes. Shake off any excess powder and cover with a second coat of mascara. Use them in a pinch or on-the-go in place of makeup brushes. Genius tip: “Roll” cotton swabs in your favorite eye shadow and store in a plastic wrap for touch-ups. Dip a Q-tip in eyeshadow that matches your hair color and apply to your roots. Start by applying a dab of lash adhesive to the tip; wait about thirty seconds until the glue is tacky (this is key) then lay the strip on top of your lashes, as close to the roots as possible. Use the side of a cotton swab to keep lashes in place while glue dries, and top off with a coat of mascara.